I’ve been kicking around this idea for some time now, but until today I had’t quite perfected the recipe. My gift to you: homemade bubble tea: a DIY guide. 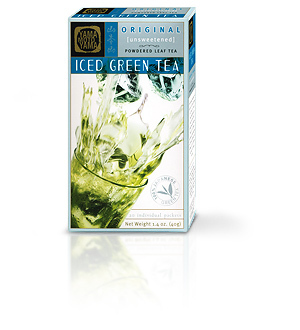 You may or may not have access to the main ingredient I’m using in mine: YamaMotoYama‘s powdered leaf Iced Green Tea mix (especially given that i have no clue where i obtained it). If not, some weak or old matcha (or maybe a fine grain sencha) will work fine as long as you use less than a full teaspoon. You’ll also need: a 16 oz glass jar or bottle with a lid, two packets/a cube of Equal or turbinado, access to a chopped ice maker (ie. refrigerator door in a lot of cases) and about 12 oz. of purified water. Combine them (it doesn’t matter in what way) and shake well for about a minute or until all the powder/sweetener has dissolved. For best results, let sit in the fridge for half an hour before consuming. I have tried to use regular sugar and it just doesn’t work: the sugar will stick to the ice for some reason and the taste doesn’t quite come out as well. Next time I’ll probably try confectioner’s sugar instead. Also, definitely use a glass bottle instead of plastic unless you can throw it in the freezer after mixing. At this point I have no idea how to garnish with your own homemade boba or jellies/pudding. I’m not so big on those, but they can be fun. Probably there’s a solution if you go up and down the candy isle with your magnifying glass. Enjoy!